Our Octavia cross pendant is a stunning design loaded with sparkling genuine Swarovski Elements crystals. The 'Octavia' pendant features 15 beautiful rhinestones in all - 5 octagonal cut Light Topaz crystals and 10 round Clear Swarovski crystals. 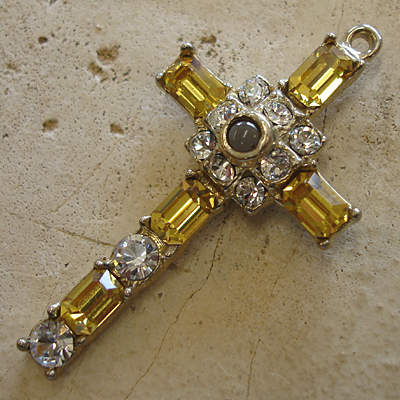 This cross comes from the 'Octavia' TM from the SJC 'Vintage Collection' TM. The golden Light Topaz crystals are the November birthstone. 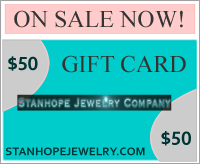 Choose from Sterling Silver, Silver Tone, Gold Tone, Gold Plated, or Vermiel. This setting is accented with our ultra-high resolution stanhope picturelens. A peep inside the stanhope center reveals the crystal clear image of your choice or to personalize your Octavia cross, upload your own favorite photo. You can also add your own custom message or title. There are many images to choose from including Jesus, The Holy Family, Ten Commandments, Psalm 23, L'Ascension, The Lord's Prayer in English, Spanish, Hebrew and quite a few others. You may also select to add a chain in various lengths. Nicely packaged in a gift box and arrives with a gift bag with tag. Made completely in our workshop in the USA.